This post features two snap previews for second round action at day four of the 2017 Wimbledon Championships including a tricky match for one of the favourites, Karolina Pliskova against Magdalena Rybarikova. For recaps of all the action from the top half of the women’s draw on Tuesday, check out Set Points #1 for the first quarter HERE and Set Points #2 for the second quarter HERE. Without doubt, the match of the day on Thursday will pit the number three seed, Karolina Pliskova against Magdalena Rybarikova. Pliskova was widely tipped as one of the title contenders for Wimbledon following perfect preparation in Eastbourne where she won the title with victories over Svetlana Kuznetsova and Caroline Wozniacki. In her first match at Wimbledon, Pliskova delivered a stable display on Court No.1 to beat Evgeniya Rodina, 6-1 6-4. Rybarikova won her first match at Wimbledon, 6-4 6-1 against Monica Niculescu. I’d love to tell you more about this match but it was on the unstreamed court 4… gutted! Rybarikova made her comeback on the ITF circuit in February following surgeries on her wrist and knee last year and has been tearing it up since. Rybarikova has won 31 of 36 matches and headed into Wimbledon with 13 wins on the grass including two titles at the $100k tournaments in Surbiton and Ilkley. Surprisingly, Rybarikova’s record at Wimby has been dire and this was only the second time in ten attempts that she has reached the second round. This will be a first career match-up between the pair and scanning the draw, it’s a pivotal match as the other two seeds in this section, Anastasia Pavlyuchenkova and Daria Gavrilova, both departed on day 2. Rybarikova has won so many matches this year and many on grass, which will no doubt bring her plenty of confidence. However, she has only played two top 50 players during this time including a straight sets loss to Johanna Konta in Nottingham. A big test for Pliskova, but if she can continue to serve as well as she has done during the grass court season, then she will be the favourite. Fun stat alert – Pliskova is aiming to reach the third round of Wimbledon for the first time in her career! I’m really excited for this first career clash on the WTA tour between the 20-year-old, Daria Kasatkina and the 21-year-old, Anett Kontaveit. 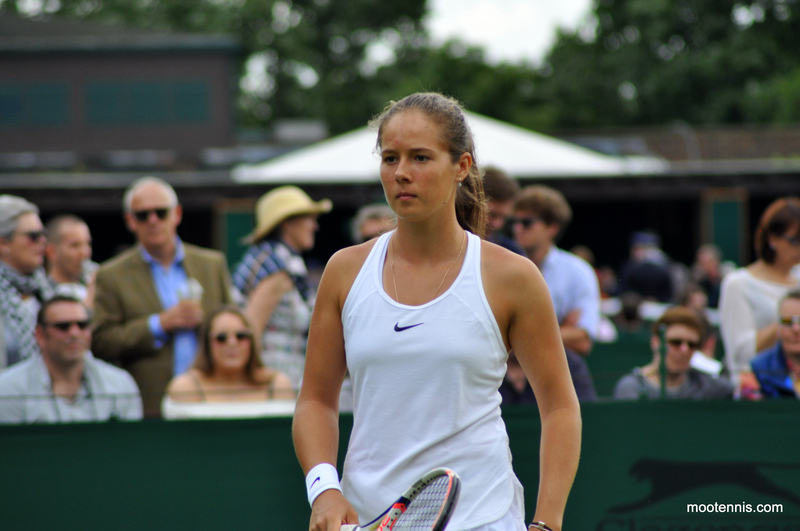 Kasatkina played her first match on grass in the first round of Wimbledon and overcame Zheng Saisai, serving out the match with an ace, 6-2 6-4. It was a good win for Dasha who pulled out of Birmingham and Eastbourne – I think it was the ankle, which she injured in Rome? Kontaveit produced another powerful display to beat Lara Arruabarrena in the first round, 6-2 6-4. The Estonian player is having a sensational year with 36 match wins already for 2017 She’s unbeaten on grass after winning ‘s-Hertogenbosch, her first WTA title. Kontaveit is high on confidence and also should be relatively well rested after skipping both Mallorca and Eastbourne. The pair will be playing each other for the first time in their career. On grass and recent form, Kontaveit will go in as the favourite. Kasatkina shouldn’t be overlooked as she has done pretty well on grass considering her lack of experience on this surface. I’m going for Kontaveit, my only remaining dark horse pick, to come through. These are definitely the second round matches I’m most anticipating! I have this awful feeling Pliskova is going to feel pressure this tournament and this match could be a real test if its here! It seems Wozniacki can’t catch a break. These are tough opening games for her. Speaking of dark horses, Anett’s play when she is on and error free is the kind that I wish I could package and give to coaches for the women when you need a quick fix. Like those kits they sell off the counter for quick repairs of tire punctures..lol. I hope she can mentally pace herself and not overdo things. There are experienced girls in the draw who can wait out her storm and let her fizzle down. I would be more surprised(happy still) if Kasatkina can make in roads in such a tournament. I think the winners this time are more straight forward today. I’m picking Konaveit’s power,on grass, over Kasatkina. Unfortunately I’m a fan of both players. I hope the match is on a big court. Super K match on court 16 = poor video. On Ashish Jena twitter site Radwanska talks about her virus induced weight loss. Hope she is ok.